Bhasbhosa recipe by Najmulsahar Khan at DesiRecipes.com. Put Column B ingredients in a pot and let it boil. Put it aside after that. Boil almonds and take off their skin and cut them in half. Mix Column A ingredients in a large bowl. Mix it well with a spoon. Spread this batter in a greased dish. 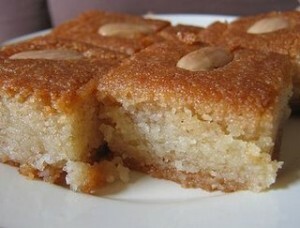 Now arrange sliced almonds on the batter in any design you want to. Put the dish in the oven for 7-8 minutes, after you see that sides are starting to turn golden, start the top grill and let it bake until it turns golden. Take out the dish and let it cool for 2-3 minutes. Spread the sheera (column A) with the help of spoon on the dish. After 5 minutes or so cut into pieces and serve.